But life seems to have a way of teaching us lessons, right? One day, out of the blue, my wife and I found ourselves expecting a baby. I had to grow up fast. I finally figured out that The Beatles already had a pretty good bass player and that I probably wasn’t going to get that gig any time soon. I had to think of some way to make a living and support a family… fast. What was I supposed to do? I did the only thing I could think of doing. I told him the truth in advance. I had no earthly clue how to do such a thing. I had no tools, no money and nobody to teach me… yet I was pretty sure I could figure out how to carve a sign. Yikes! I became a Disney Artist. Walt Disney Imagineering is the “think tank of the Magic Kingdom” and is responsible for the creation, design and construction of Disney Theme Parks worldwide. My creations have brought a few smiles to people’s faces over the years, which actually brings a big smile to my own face. 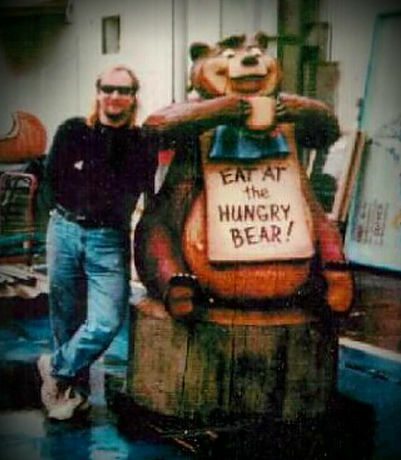 Often, my carvings and signs are the very first thing you see when you enter your favorite Disney attraction. I can’t take all the credit, of course – I’ve had the distinct honor of working alongside some of the very best. I like to tell a story with my carvings… a sort of “portal” into another world if you will. A world where your imagination rules, where there are no limits and ANYTHING is possible! I’m starting to get old. That’s just a fact. Let’s face it, there’s a limited amount of work that I can create in the time I have left, and when that is over…. You just may have a valuable piece of art on your hands. Your great grandchildren will argue over who gets to inherit this one! It’s time to pass the torch! I am now teaching private weekend retreats for beginners in my Northern California studio. Nothing would make me happier than to know that this timeless tradition will be passed along. I’m the proud father of 3, grandfather of 5, and I live in Northern California in the foothills of the Sierra Nevada Mountains with my sweetheart, Marisa. I’m also still playing that bass guitar and gigging – and giggling – after 40 years!